Sustainability at ski resorts around the globe has morphed into quite the pertinent and hot topic during these hot times of climate change. Arapahoe Basin is no different. Three members in particular are heavily involved with the sustainability and conservation efforts put forth by the resort: the senior manager at guest services Sha Miklas, the sustainability manager Mike Nathan, and the marketing and communications manager, Adrienne Saia Isaac. The trio explains that Arapahoe Basin has an incredibly supportive environment, conducive to change and eager to hear suggestions. Miklas says that they can simply go upstairs to the Business Development Group with ideas and sustainability initiatives and be met with more receptivity compared with a larger resort. “We have a high level of engagement from a majority of employees,” she continues, “and top to bottom, we have a lot of people participating.” Miklas herself started working in the ski school 13 years ago, then moved up to the call center, to tickets and passes, and eventually was promoted seven years ago to where she is now in guest services and manages Nathan in his capacity as Sustainability Manager. She has created her own position, forging it for herself out of an era when sustainability was more of a notion than a practicality. She wanted to push the upper management to begin solidifying a comprehensive sustainability program that encompasses education, resource conservation, and environmental protection. “Like Sha said, we work together on the conceptual side of things, like what projects are worth pursuing,” Nathan explains, “and there is a lot of collaboration between us and the community and the county because she’s so involved in all three.” Nathan worked his way up to this, his 7th winter with Arapahoe Basin, from being a lift operator, to a lift supervisor, to being the assistant manager with Miklas in sustainability and guest services. Nathan conducts about 90% of the ‘ground work’ for the duo and explains that, between the two of them, they find a large number of open ears and minds within the resort when they have questions, suggestions, or notice general inefficiencies. Around the resort, there are constant monitoring and assessment programs. For instance, utilities, resource usage, solid waste, greenhouse gas emissions, and water use are all tracked through a program provided by the National Ski Areas Association (NSAA) Climate Challenge. Arapahoe Basin also compiles an annual sustainability report which details the above outputs and various energy issues around the resort. “With that,” explains Isaac, “we are able to target areas we want to improve on and to have a clear goal for the climate challenge.” At the moment, this goal is to significantly reduce outputs by 2020 and to conduct a project or program every year that contributes to the acquisition of this goal. At the moment, this goal is to significantly reduce outputs by 2020 and to conduct a project or program every year that contributes to the acquisition of this goal. Some of the projects of past years include lighting retrofits in 2011, a vestibule reconstruction for better energy efficiency in 2013, and a free-air refrigeration system in 2015. “The reduction programs must be a very specific project with a physical reduction,” explains Nathan, highlighting that the yearly projects are no small check on a large list of initiatives. 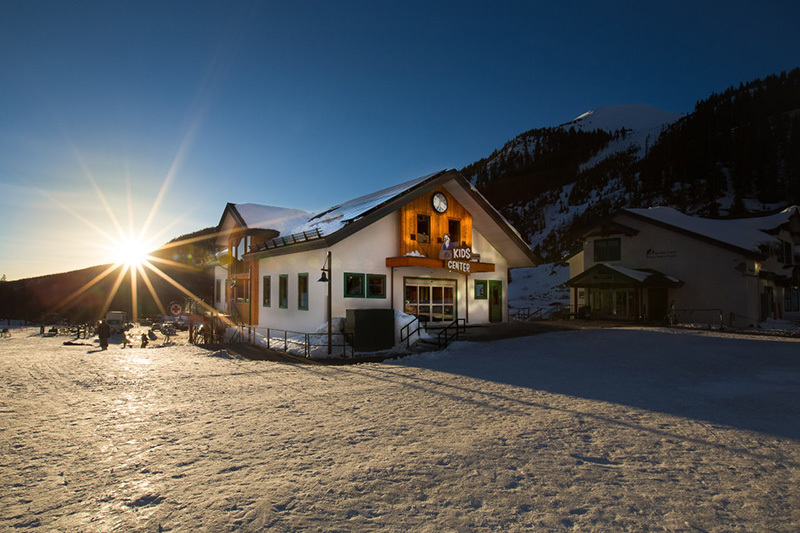 For example, in conducting the recent remodel of the base area as well as constructing the Kids Center, Arapahoe Basin decided to use passive solar, LED lighting, air lock vestibules, and occupancy sensors on all new light fixtures. In the Kids Center in particular, there is a 50-panel solar array on the roof that has the capacity to produce 20-50% of the building’s energy use. Moving outside buildings in the base area, Arapahoe Basin has recently been approved for expansion into the Beavers area, which will take place over the next two years and which will open an additional 468 acres of terrain. Throughout the long process of approval, the resort was in close contact with the Forest Service about ways to mitigate the potential environmental impacts of the expansion, for they are of concern to the Forest Service, the resort, the wildlife, and the public. Similar to the expansion of the Montezuma Bowl, the Beavers expansion limited road building, limited on-the-ground equipment, and brought in any necessary equipment in the least-impactful way possible: by foot, by helicopter, or by snow. “With our past work and the way we run the whole ski area, we have a good relationship with the Forest Service,” explains Nathan, referencing both the Beavers expansion and the Montezuma Bowl, for which the Basin received a Silver Eagle from the NSAA for mitigating visual impacts. “They know we will take all these considerations into mind as we begin thinking of other expansions or plans.” Another consideration that Arapahoe Basin has is for its guests and their perception of the resort’s efforts toward maximum sustainability. “Everything we do here with the Basin’s sustainability, you can do at home,” says Isaac, describing the various methods of reducing water usage, waste output, and energy consumption implemented by Arapahoe Basin, especially at the base. “We’re walking the walk here ourselves, and I think we’re unique in that way. We give our guests things that they can take home.” The Basin promotes and advertises to its guests ways that they can help, both on the mountain and when they return to their hotels, condos, campers, or homes. The resort actively endorses reducing or eliminating wastes entirely, carpooling, using public transit, reducing usage of disposable items such as plastic water bottles and single-use containers like coffee cups, as well as cutting down on the amount of time cars should idle: 5 minutes for all cars but diesel, which are slated at 15 minutes. Explains Miklas, “We do this here with our company vehicles as well and ask guests to do the same. We have a huge push for carpooling and public transportation.” Arapahoe Basin also pushes for guests to take the extra second to consider what they’re throwing into the nearest trash bin and to reassess if it might be compostable or recyclable. There are hundreds of thousands of people that visit to enjoy the ski resort every year, and accessing and engaging all of them about how to make their visits and their future actions more sustainably conscious is a huge step in mitigating the negative impacts already accrued to our climate and to our planet. A significant portion of their target audience are destination skiers who travel large distances to ski at Arapahoe Basin, amassing large carbon footprints through flights and car travel before they even step foot on the resort’s property. “Some people have never even heard of compost and they can’t believe we’re putting food in bins!” Miklas says, mentioning initiatives and goals in the future for engaging and better educating their visitors, including snow sports school, and perhaps even plaques about the environment of the mountain in order to incite people into caring and to instill a more personal connection with the mountain and a sense of place for how guests’ personal impacts can be remediated. Miklas, Nathan, and Isaac ask that all guests and concerned web-goers explore Arapahoe Basin’s website and the sustainability information there. They offer that all guests should feel welcome and even encouraged to approach the Basin with suggestions about initiatives or inefficiencies noticed on the mountain. It is a pertinent time to be conscious citizens of our personal impacts, and Arapahoe Basin has taken many steps towards being the best environmental steward possible, and encourages all guests to do the same.